Shabbat (also known as "Shabbos" or the "Sabbath") is the centerpiece of Jewish life, and has been so since the infancy of our nation. According to the Talmud, Shabbat is equal to all the other commandments. Read more . . . Enjoy an elegant Shabbat dinner in a unique and intimate setting, together with other Alamedeans. 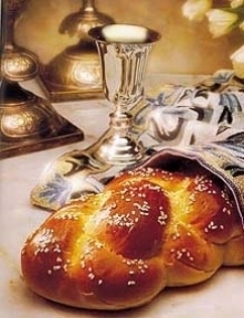 Dine on traditional Shabbat delicacies, complemented by a selection of kosher wines. Join our bi-weekly services and enjoy the inspiration and meaning of prayer with chasidic song and spirituality. A light kiddish will be served as well. The next service will be held on April 28 at 10:00 am. For more information, location details and for a complete schedule of regular services, please contact us at rabbi@jewishalameda.com.